It is amazing what you can do with a little vision, even if you are pretty tied by budgetary constraints. Nate Powers and his team of students pushed their budget, and skills to the edge to create a low end (though high value) dancers bullet time shots. The challenges and work frame on this project were quite different from the ones described on a previous crowdfunded bullet time shoot, so I asked Nate to share a bit about the project. 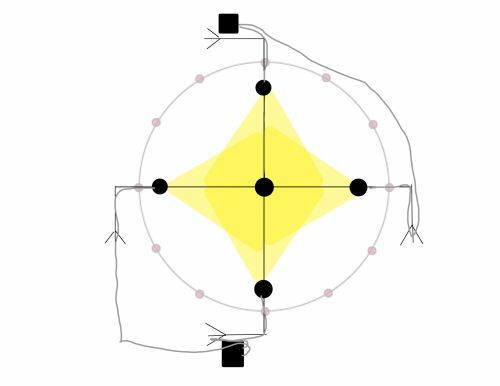 As students, we are constantly looking at new techniques and images to find out how would we approach this? How can we push this further? What would we have done different? After watching Ryan Hughes’ video and behind the scenes, I realized this was a project I wanted to take on. As students we took a look at what needed to be done and tried to figure out how we could build this shoot with the gear restrictions we had available to us. 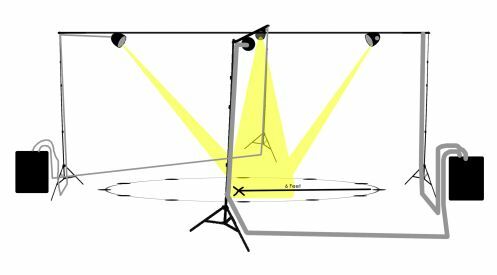 Well with my passion of theater and dance performances, I realized that I wanted to create a stage style lighting system. I had to first figure out the studio space we had available and how much room to allow the dancers a safe space to perform their moves. Earlier in the week I had access to that studio and measured it out. we had roughly a 12 foot circle for the dancers to perform in. We used four of the background kits, used 5 of the Impact Super Clamps with the nugget to attach the strobes to the background kits. All of the 5 Norman strobes were used with 5 inch reflectors and 15 Degree grids attached. This wat light is restricted to the dancers. We raised the background stands as high as we could and angled them all into one central spot on the floor. We used the modeling lights trimmed down so that dancers would be able to see what was going on after a moment. I had access to the studio during the week. I decided to tape the center of the room using PH Free tape. The tape would stick but not permanently therefor would not damage the floor. I used 6 pieces of 14ft string and marked off the camera locations using a protractor and marking off every 30 Degrees for 12 cameras much like a clock. The day of the shoot we made sure that all 12 tripods were the same model and same gear heads as a pistol grip VS a 3 ball head would be different heights. During setup of the shoot I delegated certain jobs to specific people. Being a Navy Veteran, I have learned that delegation can make the world of difference as there is always something that can be done before the talent shows up. My assistant had a tape measure and a hot shoe bubble level. After making sure the camera was level he ensured that the cameras were all on the same height levels. With the triggering being the largest issue of our shoot we had to find a way to get the cameras all open at the same time. 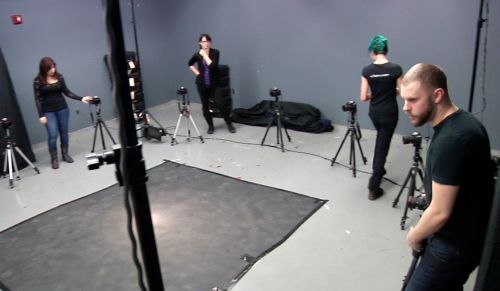 We decided that 12 cameras being triggered by 12 assistants would be ideal, all of the cameras being set to a pre-determined ISO of 200, F/22 and a 2 seconds exposure. This would allow the dancer to get into position where I would have a handheld PocketWizard remote triggering the flashes. The long shutter also allowed the difference in shutters being pressed. However with any shoot, some assistants were not able to participate. So with any great shoot, Adapt and Overcome. 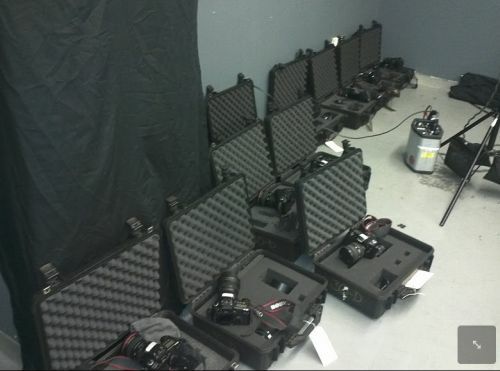 I had 6 photographers present, but 12 cameras. We figured out that we would have every other camera set on the 10s delay shutter. We pressed those cameras and would rotate to the camera to the left. When the red lights on the timer cameras went solid we all would press the shutters for the regular shutter cameras. This took a bit of practice but we managed to get most of the shots open at the same time and the dancer would strike their pose and I would pop the flash triggers. I had asked all the assistants to wear darker clothing as the camera across from them would possibly catch brighter clothing. After downloading all the cards, we started to compile folders for each dancer, then each pose. I would take the 12 images of each pose, then bring them into photoshop. In photoshop, I then selected around the dancer and dropped it onto a black background. I had guides for certain spots like heads and feet to ensure that the scales remain the same. From there we would places all the jpegs into a movie software and flip through the jpegs over and over. The flipping through created the 360 effect we were after. After the shoot was completed, We asked the dancers to return to the studio and discuss what they felt about the shoot. At this point they had already seen some of the results and rotations. My first and second assistants were also interviewed as they were a crucial part of my team, and I was later interviewed. The entire process was then edited to show a time lapse of setting up, shooting in progress, showing Ryan’s video and inspiration, and showing our results. The largest message we wanted to show the world is that together as a whole we are strong. The artistic community is filled with amazing minds and talents. We wanted to show that students are capable of great projects much like Ryan Hughes’ 360 project and that we too could complete this project on our restrictions. The project was a success and it was truly amazing seeing the pieces come together. I had spent 70 hours planning and to see the final product and even the shoot come together was quite amazing. Our faculty were behind us and some even attended during the weekend shoot. One faculty member brought his family in to watch this shoot and another watched via U-Stream. Inspiring the world is something I look forward to do every time I pick up my camera, and I think it will only make our industry stronger to show more of these large scale shoots done by students on smaller budgets.